There are at least 8 bands called Jaguar: 1) A NWOBHM band formed in Bristol, England who had moderate success throughout Europe and Asia in the early 80's. Further information follows below. 2) A Japanese Visual Kei band (????) formed in 2004 by Rara(Vo), Ichigo(Gu), Yuuri(Ba) and Naruka(Dr). 3) The hard Techno alias of Alec Empire, under which he released an album and several EPs from '94 to '96, including collaborations with Ian Pooley. See also Richard Benson for a related project, and the oddly-named Jerky J Master 'Disaffected' Cool for a house diversion around the same time. 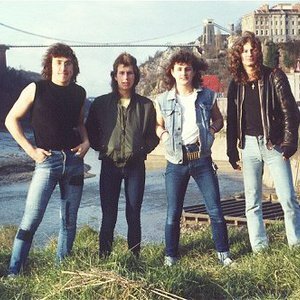 1) A NWOBHM band formed in Bristol, England who had moderate success throughout Europe and Asia in the early 80's. Further information follows below. 2) A Japanese Visual Kei band (????) formed in 2004 by Rara(Vo), Ichigo(Gu), Yuuri(Ba) and Naruka(Dr). 3) The hard Techno alias of Alec Empire, under which he released an album and several EPs from '94 to '96, including collaborations with Ian Pooley. See also Richard Benson for a related project, and the oddly-named Jerky J Master 'Disaffected' Cool for a house diversion around the same time. Aside from The Destroyer on DHR, full-length solo releases during this period were otherwise mostly experimental techno on Mille Plateux (under Alec's own name), on top of numerous breakbeat/breakcore side-projects on Riot Beats as E.C.P., among others. 7) UK trio band formed in London with Malcolm Carson (vocals/guitar), Tam Johnston (drums/vocals), and Julian Carr (bass), active in 1997-1998. forced to change their name from Jaguar to Carson. 8) Danish rock band active from 2002-2005. 1) The original December [yearformed]1979[/yearformed lineup consisted of Garry Pepperd (Guitar), Jeff Cox (Bass,Vocals) and Chris Lovell (Drums). In the following April Rob Reiss was added as vocalist/frontman. They built a strong local reputation and recorded two demos the latter of which earned them a deal with Heavy Metal Records, and in 1981 they released single Back Street Woman, a NWOBHM cult classic which sold over 400,000 copies. Unfortunately the band then had a major disagreement with the record company and the contract ended. Disillusioned, Reiss quit and was replaced by Paul Merrell. In 1982 a strong performance at a Dutch rock festival won them a new deal with Neat Records and subsequent single Axe Crazy sold reasonably well. After intensive touring, debut album Power Games was released in early 1983. They were well known in British heavy metal circles and prospects were promising. Follow up album This Time followed in 1984 and was a marked change of direction, showing a Dance Music influence. Drummer Lovell hated it and was replaced by Gary Davies. The marked change of direction alienated much of their core audience and sales and interest evaporated. The band released Horrible Truth in 1985, but by the end of the year there was little interest in them and the band folded. A revival of interest in the NWOBHM in Europe and Japan and a successful re-release of their first album in those regions propmpted a reformation in 1999, with modified lineup of Peppard, Jeff Cox, brother Nathan Cox on drums and vocalist Jamie Marten.